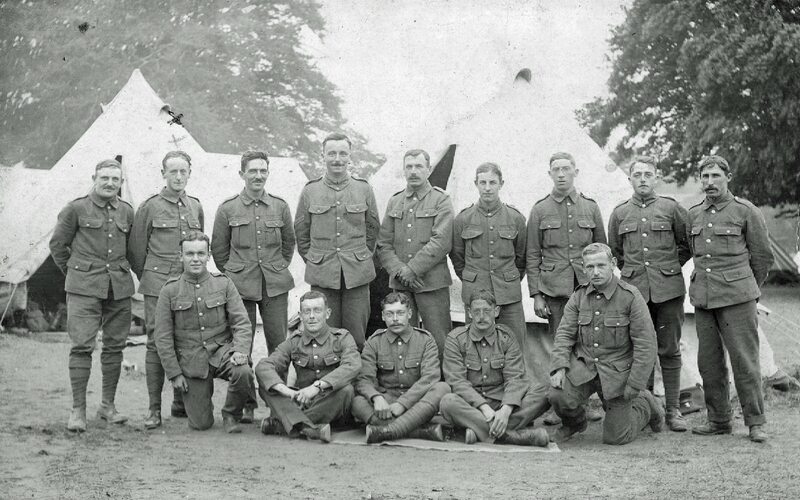 The photograph above is known to be of Jerseymen who were members of the Jersey Overseas Contingent (or Jersey Company), who had volunteered to serve with the 7th Battalion, Royal Irish Rifles, and who had left the Island during the first half of 1915 for Ireland. 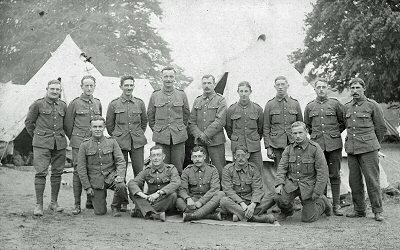 The location was a tented camp set up in the grounds of Convamore House, the ancestral home of the Earls of Listowel, while the photograph itself was taken between the 19th of June when the men had arrived there, and the 23rd of July when Rifleman Charles William Blampied (marked with an 'X') tragically drowned while swimming in the River Blackwater near to the camp. It would be appreciated if visitors to the website could provide the CIGWS with the names of the other men via our 'Contact Us' facility. Please remember to include your email address.